The Great Catch is a 3-reel 3-row 20-payline progressive jackpot video slot machine produced by Magnet Gaming also featuring 3 unique and rewarding bonus features such as Shark Hunt, Game Chance, and Fish Finder. Explore the ocean and land a big win of up to 192.000 coins or enjoy other prizes including Free Spins and Multipliers. The Great Catch slot review brings a compilation of proven tips, so keep reading to find all important details. Unfortunatly, we have no free play mode for The Great Catch available. Check out the screenshots below and hop right into action with one of the recommended casino sites! This is a game you can play for fun and learn how to win without making any real money investment. It’s also a good way to work thoughtfully on your betting strategy later to be employed when chasing for the big win. For this purpose, we share an important info: the coin value stands at €0.01, but you can adjust the amount you wish to bet per spin starting from €0.10 to €8 since the game has 20 adjustable paylines. The paytable is packed with symbols closely related to fishing and sea life, so you will find Boots, Bottles, Fish, Lobster and Pearl as those with a slightly lower rating than Gold Coin or Sea Treasure. To receive a number of coins, you have to line up 3 items of the same kind, where the lower-paying bring between 800 and 4.000 coins. On the other side, highly-rated icons will pay 6.000 or 12.000 coins. To activate The Great Catch Bonus games, collect 3 belonging symbols and start another screen packed with rewards. Finally, each time you form a winning combination, the game will award 1 extra spins, which makes the number of The Great Catch Free Spins practically unlimited, presuming the Lady Luck is on your side. Moreover, this also increases the size of the Multiplier from 1x to 5x. When talking about the jackpot prizes, Jackpot Flash pays up to 60.000 coins, while Super Jackpot comes with a maximum of 192.000 coins. Initial amounts expressed in real money start from €1.000 and €15.000, respectively. Throw a dice in the Game Chance to set the fishermen to sail for 6 possible prizes 32-64000 coins, Jackpot/Super Jackpot Flash and other bonus games. Fish Finder grants 10 moves during which you need to find a fish among 22 possible options with the following outcome: 1.600 coins, 2 extra moves or the Jackpot Flash. Swim around the islands in the Shark Hunt mode that starts with 10 free spins and roll a dice to earn more. 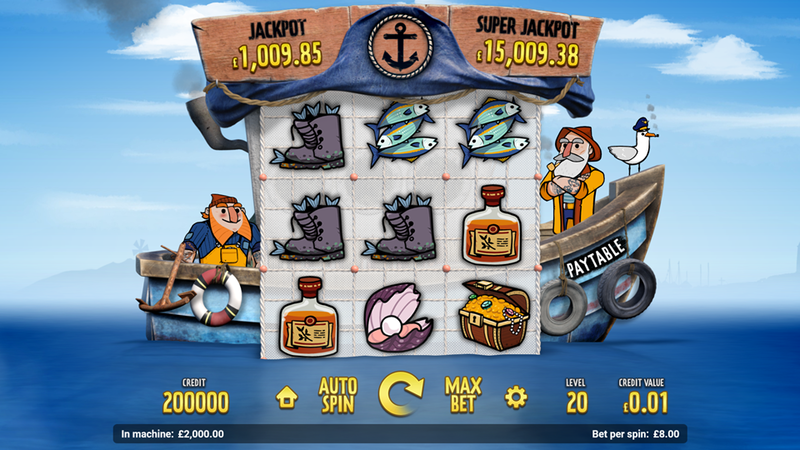 When a shark is caught, the winners get to enjoy 3 extra spins with compass, Jackpot Flash or Super Jackpot Flash. You can play online on the Magnet Gaming powered sites without a need to download an app or the .apk file for Android or iPhone. 3. What is the RTP factor of The Great Catch? According to the official info, the RTP is 96.50%. With its classic gameplay and tons of coins waiting to be collected, this is a challenging game certainly worth your time and efforts. The Great Catch recension simply hadn’t enough space to bring all prospects, so it would be great if you try the game and discover the treasure on your own.